For long periods in this nation’s history manufacturing was the dominant industry, providing jobs and financial security for wide swaths of the population. Today manufacturing is not the force it once was with service jobs being the go-to occupation for many workers. This movement of manufacturing jobs out of America became a big political issue the 2016 presidential election. In some places across America however, manufacturing industries are still thriving. Ready to buy a home? Check out mortgage rates. In order to find the best places to work in manufacturing, SmartAsset looked at data for 483 metro areas. Specifically, we looked at data on employment growth in manufacturing, income growth in manufacturing, density of manufacturing jobs and housing costs. To see where we got our data and how we put it together, read our data and methodology section below. 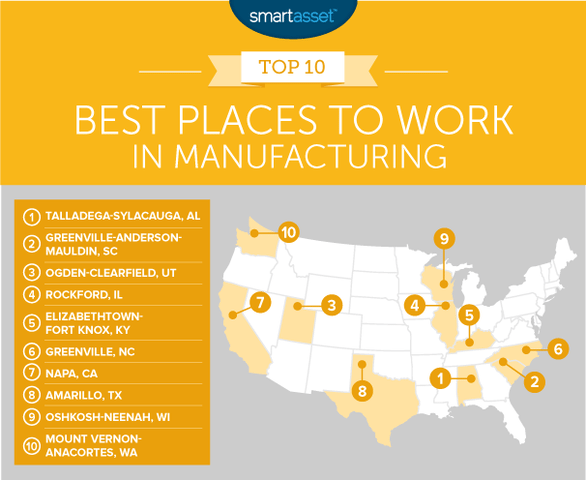 This is our second annual study on the best places to work in manufacturing. Check out the 2016 version here. No big cities – Smaller metro areas dominated this list. The average population across our top 10 is about 300,000. But if you discount Greenville, North Carolina and Ogden-Clearfield, Utah that figure drops in half to 150,000. 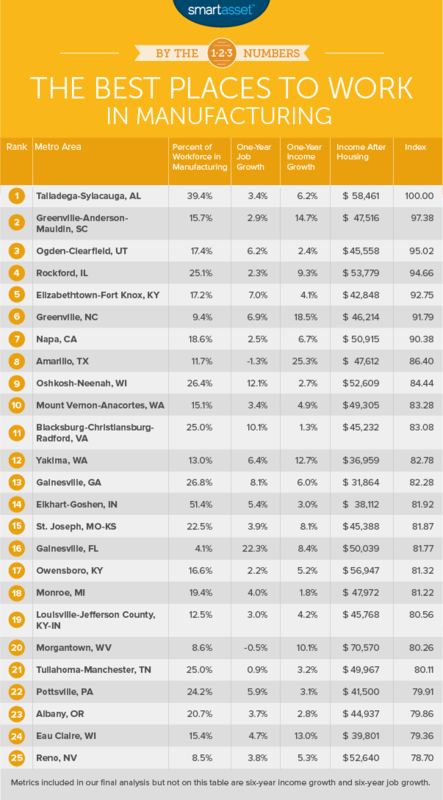 The largest metro area in our top 25 is Louisville-Jefferson, Kentucky-Indiana, which has 1.2 million residents. Large variance across metro areas – In this study we found that there are some places where manufacturing jobs are growing pretty rapidly and others where manufacturing jobs are leaving in a hurry. For example, in Rochester, Minnesota the number of manufacturing jobs dropped by almost 30% from 2010 to 2015. In other places, like Ogden-Clearfield, the number of manufacturing jobs grew by 55% from 2010 to 2015. A large chunk of the workforce in this Alabama metro area work in manufacturing – just over 39%. Only three other metro areas in this study can beat this stat. Manufacturing jobs here also pay pretty well, especially when you consider the area’s average housing costs. We estimate the average manufacturing worker earns $58,461 after accounting for housing costs. Greenville-Anderson-Mauldin takes second place due to strong growth in manufacturing employment over the past few years. From 2010 – 2015, the number of manufacturing jobs in the area grew by 37.8%, a figure beaten by only 5% of metro areas in our study. The growth in jobs is accompanied by growing incomes. From 2014 to 2015 the average income for a manufacturing worker here grew by 14.7%. That’s the 13th-fastest rate. Ogden rose in the ranks from ninth last year to third this year. From 2010 to 2015, the number of manufacturing jobs around Ogden-Clearfield grew by an impressive 55%. Of course, having a job is one thing, but you also want to make sure you are being paid well. Over that same time period incomes for manufacturing workers grew by 31%. After paying for the median house, we estimate that the average manufacturing worker in Ogden-Clearfield would earn $45,600. Hopefully that’s enough for workers to start saving for retirement. In the past, Rockford was known as a manufacturing hub which produced heavy machinery and tools. While the area has declined since in heyday, Rockford is still a great place to work in manufacturing. About 25% of all workers in Rockford are employed in the manufacturing industry. Plus, working in manufacturing pays well here. We estimate that after paying for housing, the average manufacturing worker would have about $54,000 left. Of course, some of that will be going to the local tax man. Illinois has a flat income tax rate of 3.75%. Elizabethtown-Fort Knox, located in central Kentucky, has a strong manufacturing economy. Census data from 2015 shows 7,000 people work in manufacturing or about 17% of all workers. That number may continue to rise in the future. From 2010 to 2015, the number of manufacturing jobs here grew 41%. In just one year, from 2014 to 2015, it grew by 7%. One concern for manufacturing workers here may be their pay package. According to our data, they earn $42,800, on average, after accounting for housing costs. That’s the lowest figure in the top 10. Greenville ranks well due to the stunning increase in manufacturing workers’ median incomes. The average manufacturing worker in 2015 earned 27% more than they did in 2010. Just from 2014 to 2015, the average manufacturing worker saw their incomes rise by 18.5%. However only 9.4% of workers in this metro area work in the manufacturing industry, a score which lowered Greenville’s overall ranking. You might know Napa for its wine. Indeed, Napa is mostly a wine-producing region but that is one of the reasons it ranks so high in this study. About 11,500 people are employed in the manufacturing industry in Napa, 8,000 of whom are employed by wineries. Overall about 18.6% of employed people in Napa worked in manufacturing as of 2015. Another positive metric for manufacturing workers in Napa is their pay. According to our data, after paying for housing the average manufacturing worker earns around $51,000. Income taxes are a concern here, however. California has some of the highest income taxes in the nation. Amarillo takes eighth. This metro area is located in north Texas. It scored well in three growth metrics which propelled it up the ranks of this study. From 2010 – 2015, the average manufacturing worker saw their income grow by almost 39%, or the eighth-fastest rate in the study. From 2014 – 2015, that median income increased by 25%, the third-fastest rate in the study and fastest in the top 10. Just about 22,000 people in Oshkosh-Neenah are employed in the manufacturing industry. Paper manufacturing and transportation equipment manufacturing are the most popular industries, with 4,776 and 4,679 employed workers, respectively. Oshkosh-Neenah scored well in this study because of its density of manufacturing work. According to our data, about a quarter of all workers are employed in manufacturing, a number which may rise in the coming years. From 2014 – 2015 the number of manufacturing jobs grew by 12%. Mount Vernon-Anacortes takes the final spot in our top 10, thanks to above-average scores in every metric. This metro area’s best scores are income related. From 2014 – 2015, the average income for manufacturing workers increased by 5%. Mount Vernon-Anacortes ranks in the top 20% of all cities in both those metrics. We estimate that manufacturing workers earn about $49,000 after accounting for housing costs. Plus, Washington has no state income tax, meaning those workers should be able to keep a decent chunk of their paychecks. Manufacturing as a percent of workforce. This is what percent of all workers are employed in manufacturing. Data comes from the Census Bureau’s County Business Patterns Survey. Job growth from 2010 to 2015. This is the percent change in people employed in manufacturing from 2010 to 2015. Data comes from the Census Bureau’s 2010 County Business Patterns Survey and the Census Bureau’s 2015 County Business Patterns Survey. Job growth from 2014 to 2015. This is the percent change in people employed in manufacturing from 2014 to 2015. Data comes from the Census Bureau’s 2015 County Business Patterns Survey and the Census Bureau’s 2015 County Business Patterns Survey. Income growth from 2010 to 2015. This is the percent change in manufacturing workers’ median incomes from 2010 to 2015. Data comes from the 2010 Census Bureau’s County Business Patterns Survey and the 2015 Census Bureau’s County Business Patterns Survey. Income growth from 2014 to 2015. This is the percent change in manufacturing workers’ median incomes from 2014 to 2015. Data comes from the Census Bureau’s 2014 County Business Patterns Survey and the Census Bureau’s 2015 County Business Patterns Survey. Income after housing. Data on incomes comes from the Census Bureau’s 2015 County Business Patterns Survey. Data on median housing cost comes from the Census Bureau’s 2015 American Community Survey. First, we ranked each metro area in each metric. Then we found each metro area’s average ranking, giving each metric an equal weighting. Using this average ranking, we assigned a score to each metro. The city with the best average ranking received a 100. The city with the worst average ranking received a 0. 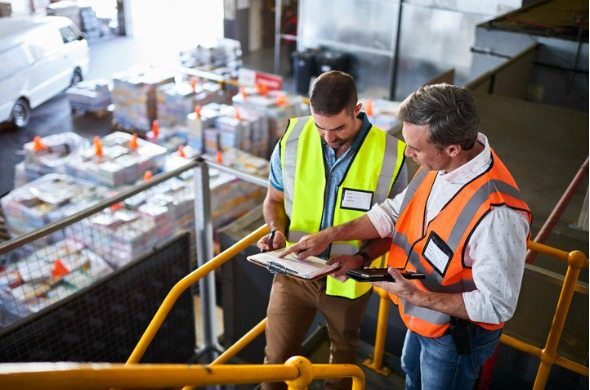 As manufacturing jobs move around the country, the people best able to take advantage of the changing industry are those willing to move. Here are some tips for making a smart financial move. Many of the best rewards cards require you to spend a certain amount before you can unlock the best rewards. By putting the costs of moving, like hiring help or renting a truck, onto your rewards card, you can hit those spending amounts without having to pay for things you didn’t need or want. Make sure you pay off that credit card debt though, credit cards come with pretty high APR’s. It may be a good idea to rent before you buy. Even if you plan on buying a home in your new city, renting for a year will allow you to research different neighborhoods to find the right one for yourself. Moving for a job which is offering you a raise is not always as good as it sounds. Before you make a big career decision, compare the costs of living in the two cities. You may end up with less income than the initial raise suggested if the new city is considerably more expensive than your current city.